This report discusses Brazil Debt Market Analysis report, Brazil bond market, Government Debt instruments in Brazil and comparison with Australia and UK markets. This report consists of analyzing the debt market of the Brazil Country. In this way, proper analysis of the country is being made in relation to considering its historical background, regulatory frame works and the factors affecting the debt market position of the country. In addition to this, the exchange rates characteristics of the Brazil economy and the involvement of banking sector in the debt market and its position, debts instruments issued by the government, credit ratings of the companies and the aspects of the derivative market of the Brazil economy are being considered. The debt market has a significant role in relation to the economic stability and increasing the success initiatives. In this respect, the report comprises of analyzing that how much the debt market of the Brazil economy is contributing towards its success. Furthermore, the determinants of the report consist of the analyzing the derivative market of the Australia and the United Kingdom because of the financial turmoil created by the debt markets. In this regard, over the counter and the exchange trade derivatives of the both countries are being evaluated in the report and a comparison is being in relation to the debt markets of the both countries. Thus, the basic structure of the report is based on evaluating the impacts of debt markets and its determinants because it is an important factor in setting the financial stability and instability of the economies. The country of Brazil came into being in 1500 and its initial colonial systems were based on the Tupinamba Indians. The people in the early history of the country started to develop their interest in the plantations and encouraged the laborers to work hard on these plantations. During the period from its development to the period of 1763 many of the changes in the structure of the country have been made and the people have explored the mines of gold, coal and many other resources to live and earn their livelihood. During the period of success and innovations in the country numerous levels of the political advancements have been made which have been affected by the European culture. The explorations continued in the country and the people invented the resources of cotton, interior, tobacco and sugar resources. The period after the 1765 was the initiation of the period of industrial development in country. In the history of the Brazil, many of the Royal families came and hold the charge of the country including the period of Dom Jao and Rio. Currently, the innovations of the world have contributed to the developments and it is operating with great reputation on the map of the world (Nytimes.com, 2016). In relation to the historical developments, the bond market in the Brazil was not much developed up to 1960. There were laws implemented on this market which limited the interest rates to 12% which made the debt securities and government securities unattractive for the economy. After this period, the 12% cap was decreased and the bond market started to incorporate the effects of the inflations. In this regard, the higher level of inflation in the economy led the government to incorporate the dynamic measures in the implementation of the interest rates and the inflation adjustments. Inflation rates continued to increase in the period above 180’s and the investors in the economy who have invested in the inflation indexed bonds faced higher level of losses in that period. In the later period of the 1986, the central bank was provided with the authority to make it’s additions in the bond market and affects the monetary policy in its own way. The early indexation policies of the banks were failed and the bonds with indexed inflation replaced the bonds with no indexed inflations. Thus, the interest payments in the country were changed and the payment of interest rates on the maturity dates was considered as the best policy to incorporate the debt in the financial policies of the bank. The policies of the country kept changing and the government of the Brazil has attempted to exempt the foreign investors in the economy from the income tax if they are holding the government treasury and other bonds. This was done by the government in an attempt to make contributions to the debt market and make it an attractive market in the world wiled sectors (Ballve, 2014). In relation to the attraction policies of the government, the participation of the foreign investors in the economy has increased and the debt market of the Brazil has started to increase. In this regard, the previous marketing conditions of the economy indicate that the debt market is off significant threat because of the marketing conditions and investors’ perceptions. On the other hand, it can be said that the country has lower sovereign risk because of the international investors are making the tradeoff’s with the economy and portfolio return risk is improved. The outlook of the debt market of the Brazil is good because of the efforts made by the government in relation to increasing its effectiveness in the economy. It can be regarded that changing trends in the worldwide inflations and the interest rates are also going to affect this market because the past trends in this economy have been making contributions to the debt market of the Brazil. In this way, the future of the debt market of Brazil cannot be estimated because there are continuous fluctuations in this market. The government and the investors are the biggest factors in relation to operating and managing the risk of this sector and changing its conditions. There are many kinds of laws and regulations imposed on the bond market of the Brazil. From past to present, there have been many kind of regulatory documents imposed on the bonds market of the Brazil such as 6385 law of the 1976, 9475 law of the 1997 and the 10303 law of the 2001. In this respect, the laws and regulations considered to be implemented on the bonds market of the Brazil consist of taxations, prudential rules and bankruptcy policies and the standards (Cbonds.com, 2016). The taxation laws in the debt market of the Brazil consist of the income tax, the IOF tax and the CPMF tax. IOF tax is applied on the transactions which have holding period less than the 30 days whereas the CPMF tax is applied on the bank account and the cash flows out of the investments at the rate of 0.38%. In addition to this, the income tax applied on the Brazil economy consists of 22.5% in the period of 2005. The interest payments on the bonds are based on the deductions of the withholding tax. The taxation policies of the government have been problematic for the bond market of the Brazil. This is due to the reason that the holder has to pay full tax on the whole period in which the binds are holed by them. On the other hand, the buyers only have to pay the tax on the period of the trade of the bond. This situation is becoming worsening for the economy because of the higher number of the individuals and the companies have started to make direct trade relations with the economy and the growth of the bond market in the Brazil have become stagnant. These are the rules applied to the companies having the CVM bonds in trade publically. In relation to this law, the companies or the bond issuer should have to register itself with the CVM. It is a restriction in the bond market of the Brazil that the only registered bonds can be traded in the primary and the secondary markets. In this way, instructions of the CVM in relation to the bonds market are the restrictions on the trading of the bond and other kinds of the securities. In accordance with these laws, a book building procedure is implemented on the bond holders which require the consultations procedure to be implemented. The bond holders should have to make consultations with the regulators and the record of these consultations should have to be kept by the companies and the holders (Ricardo Leal, 2006). In addition to this, the prudential rule requires that the bond holders should have to be represented by the fiduciary agents which are regarded as the protector of the interest of the bond holders. In this way, this policy of the regulatory bodies is good in order to support the bond holders by notifying them when the issuer has not fulfilled its duty with regards to the issuance of the debt and the relevant facts. Moreover, the higher level of the restrictions have been imposed on the pension funds holders that the local government is not allowed to hold more than 20% of the holdings from only one bond issuer in the corporate bonds sections. On the other hand, the pension funds holders are allowed to hold the 100% of the treasury funds. These policies have been implemented in relation to decreasing the values of the corporate debt and increasing the values of the treasury securities. Thus, it can be analyzed that the corporate debts are not significantly supported by the central Bank of the Brazil and it is imposing the penalties on the corporate debts which are not relevant for the treasury securities. In 1945, the bankruptcy laws in relation to the bond market were imposed. The bankruptcy standards were based on the implementations of the standards which give priority to the collateral bond holders, tax authorities and the employees. In this regard, the policies are implemented for securing the rights of the bond holders in the case of bankruptcy. In 11101 law paper, a reorganization procedure was implemented in relation to the securing the rights of the creditors, such as the fixed and floating collateral holders. In this way, the legal issues should have to be resolved before the creditors are in the charge of the selling the assets. Basically, the law does not incorporate the significant level of distinguishing factors among the creditors and the bond holders rather it is distinguishing in the factors of the collateral (Leal & Carvalhal-da-Silva, 2008). According to the laws issued, the bankruptcy of the company will not be significantly impacting the bond holders because in the case of bankruptcy, the bondholders will be paid as first. In this way, different kind of the bonds issued in the Brazil does not pay any kind of the collateral. It can be analyzed that the conditions of the bondholders in the economy of the Brazil in relation to bankruptcy is lower so they are not offering the collateral bonds to the holders. This is due to the reason that the potential issuers will not get benefit from the issuance of the bonds in the collateral. The local exchange characteristics in the bond market of the Brazil are set by the government. In this regard, the exchange characteristics in the bond market are based on the yield curve, diversification risk in the external markets and the reducing the external level exposure. In relation to these policies, the maturity of the public debt security is challenging in this industry of the Brazil. There are lesser concerns in relation to the average maturity period from the local exchange companies in the Brazil. According to the policies of the government, the average maturity period in the exchange debt securities is 2 years and for the government exchange trading bonds, this rate is more than 3 years (Teixeira, 2013). It is analyzed that the private investors in this economy prefer the short term variable rate debts because of the facts that the longer debt period due to the exchange rates policies are not beneficial for them. In addition to this, many kinds of the local investors are taking the facility of swapping their bond exposure with the fixed rates bonds traded which are at lower risk detriments to the investors. The policies in the traded security market in the Brazil market are creating the opposite position. Thus, the characteristic of the floating trading markets are shifting towards the fixed exchange rates and the growth in this effect is expected in the market. The Swaps in the trading debt security markets usually provide the benefits of mitigating the exchange rates risk in the economy. The investors start to exchange their traded bonds with other bonds which are exposed to less risk. In this way, the confidence of the issuers and the holders is increased due to the capacity of maintaining the market risk exposure due to the change in the debt markets. This policy in the Brazil debt market is operated by the government in relation to decreasing the level of debt risk consideration. The reason is that the crises period has given the higher level of the experience to the government and the investors to deal with the exchange exposure. Moreover, the characteristics of decreasing the maturity of the exchange period are also being considered in the debt market of Brazil. The reason is that the lower level period of the exchange could result in benefiting the debt issuer and the holder in a way that they will not have to incorporate the market fluctuations risk such as interest rate risk for so long and the deliberately worsening positions of the market will not be affecting both bond holders and the issuers. Thus, the exchange rate risk does not heavily affect the efficiency of the debt issuing. Moreover, the participation from the different kind of investors has increased in the diversified bond securities. The reason is that some bond securities are attached to the lower risk and others are attached to the higher level of the risk which results in making the different kinds of trading trends. The banks in the Brazil Economy are trying to invest in the short term trading debt and they are matching it with their short term liability positions. Therefore, the domestic exchanges in the debt trading market of the Brazil are causing the significant changes in the economy and the trend is changing as well (Teixeira, 2013). In addition to this, the pension funds are trying to invest in the long term hedging funds and they are trying to implement the policies of the mitigating the long term inflation risk in the debt market of the Brazil. In addition, the nonresidents in the Brazil are trying to take the advantage of the fixed rate instrument for the purpose of having the lower level of uncertainty in the market. The credit spread in the economy of the Brazil can be considered as the highest level. In this regard, the role of the banks is significant in relation to reducing the credit spread. The policy of the companies in relation to mitigating the credit spread is based on the provision of syndicated loan. The syndicated loan is the loan provided by the group of people to the bankers and operates in the providing the loan facility to the borrowers. These reduce the level of risk in relation to the level of risk in the economies. In the Brazil, it has been analyzed that the syndicated loan facility has been provided by the banks for supporting the merger and acquisitions. In relation to this facility, he acquiring companies are able to borrow from the banks and they are getting into the syndicated loan by transferring the risk to the banks arrangements. The current analysis states that the level of credit risk is much higher in the economy because of the facts that the higher level of base interest rates operated in these economies. The judicial uncertainty in the Brazil economy is contributing as the factor of higher interest rates in the economy (Paula, 2011). The credit spreads in the economy is higher because of the facts that the policies of the central bank are not consistent with the regulations. The central bank has attempted to promote the lower interest rates but the credit spread in the economy is rising rapidly. The reason is that the base interest rate in the Brazil is continuously fluctuating and it is causing the bad equilibrium policies in the economy. In this regard, the monetary policy in this economy is tighter than it is required. The reason of the higher level of interest rates in the economy is imposed in relation to analyzing the credibility of the central bank. In this regard, the floating and the fixed interest rates mechanism has been introduced for the purpose of making changes in the monetary policy and making it relevant to the action plans suggested by the government. In this regard, it is expected that the equilibrium pricing mechanism will be introduced by the Central Bank of the Brazil. Additionally, it is analyzed that the government has taken the actions for the regulating the fiscal needs and making the regulations to be effective in the country. These fiscal needs are implementing the pressure on the external economy and private debt levels which is an effect of the equilibrium hypothesis. Moreover, the central bank of the Brazil has attempted to make changes in relation to making the fit in with the international policies in the Brazil. They are trying to convert the real time interest rates policies that are relevant for mitigating the external economy pressure on the interest rates of the Brazil. In this way, the central bank is trying to make conversion easier according to the international policy initiatives and the decreasing the impact of the higher level of fluctuating interest rates in the Brazil. The central bank of Brazil has developed a project named as the Credit risk center which helps in analyzing the threatening position in the economic factors. This project is aimed at analyzing the credit risk which can be caused through the increase in the credit spread above the $5000 of the United States risk. However, a major threat can be analyzed on the policies in relation to the privacy concerns. The data of the project of the Central credit risk center is only accessible by the authorized persons who are responsible for making policy initiatives in the Brazil. The central bank of the Brazil is not ready to bear any threat to the data and they are implementing the privacy constraints which restrict the data to be only accessible by the financial institutions and the Central bank. The main purpose of this project is to obtain the authorization from the debtors in order to promote the public consultations polices and increasing the debt base in the economy. Thus, it is expected that this project will help in reducing the cost of debt because of the availability of the higher level of information in the market about the borrowers and the lenders (Leal & Carvalhal-da-Silva, 2008). The Central Bank is promoting the facilities which are providing the realistic level of the credit information sharing among the borrowers and the lenders. In addition, central bank has made plans in order to control the credit center policies and providing the true knowledge in the environment. Thus, they want to introduce the true level of credit record database and helping the investors and the borrowers in an effective way. Moreover, the central bank has also introduced the plans in relation to making the regulations which are helpful in introducing a fair system of records among the different kinds of financial institutions. The central bank has also pressured the government to change the policies in relation to the tax imposition in the country. In this regard, they have implemented the measures which support the relative growth with regards to trading of the financial securities in the country. The most important measure in effect was the securitization of the credit spread loans and the credit bills. The securitization helped in replacing the loan agreement and imposing it under the commercial law. Thus, the need for proving the existence of the debt laws has been removed. In this law, the instruments are also provided which will be helpful in implementing the policies of the securitization. According to the new laws and regulation, the banks in the Brazil will be able to issue the credit bills in relation to securing the rights of the real estate owners and facilitating them with the debt facility. These securities provided by the banks are considered to be safer than the asset backed securities which involve higher level of risk in the real estate market. The banks have the facility to issue the loans for more than 36 months and facilitate the investors in the real estate. It can be analyzed that the banks in the Brazil are playing an important role in regulating the debt facility in the economy and reducing the credit spread risk. There are many policies in the Brazil which are introduced by the Central Bank in order to reduce the credit spread and benefiting the debtors and investors (Leal & Carvalhal-da-Silva, 2008). There are different types of the debt instruments operated by the Government of the Brazil. These instruments are called the commercial papers, debentures, asset based securities and the international bonds. The private level securities in the Brazil are operated on the basis of short term loans. In this way, the commercial papers in the Brazil have been introduced in 1964. The minimum maturity of the commercial papers in the Brazil is 30 days period. For the public companies the maturity dates are considered to be 360 days in the Brazil economy. In the period of the 1995 to 2005, the outstanding amount of the commercial papers issued by the Government was increased from 13.8 billion to 84.99 billion. This was the significant increase in the outstanding amount of the commercial papers in the Brazil. In addition to this, the debentures were having the floating rates were approximately consisting of 80.4% of the total debt securities in the period of 2005. In relation to the debentures, the floating interest rates were increased to the higher level by 42.12% in the period of 1998. Moreover, the inflation adjusted debentures comprises of 12.45% of the total debt market of the Brazil. In this regard, the total amount outstanding in the Brazil for the debentures having the fixed interest rates is considered to be 3.18 % in the period to 2005. The amount kept increasing which caused the uncertainty in the debt market of the Brazil. In 2005, the fixed rate debenture trading was standing at the 16.28 billion per year. These debenture trading volumes are lesser than as compared to the federal debt securities (Moodys.com, 2015). The asset based securities in the Brazil are other debt instruments which are regulated by the government in the Brazil. The very first law in the Brazil was implemented in the period of 1970 which was only supporting the leasing transactions in the real estate markets. In the recent years, the financial markets of the Brazil have grown rapidly. The data on the national policy states indicates that the Brazilian banks comprised of controlling the 39% of the data in relation to the asset backed securities in the Brazil. In the period from 2011 to 2015 the amounts of the asset backed securities in the Brazil has been increased from 2.8 billion to the 7.1 billion. There is also an expected increase in this amount in the near future. It can be analyzed that the banks have issued approximately 8% to 39% asset backed securities from 2006 to 2012. In this regard, the competition in some of the Brazil banks has increased significantly due to the securitization pressure. The merger and acquisitions in the Brazil have been heavily supported by the asset backed securities in the Brazil. Thus, the amount outstanding cannot be analyzed yet because of the securitization pressure (Ballve, 2014). The public companies in the Brazil can issue the international bonds. The government in the Brazil has been introducing the international bonds at the rate of the 62.9 billion annually. The proportion of the international debt in the Brazil is 75.12% and it is decreasing to the level of the 57.73% in the period from 2010 to 2015. It is analyzed that the Brazil has introduced the international bond policies which will be matured in the period of 2026. The coupon rate of the international bonds is 6% and the amount issued in these international bonds is approximately 1500 million. It is expected that these bonds will be sold at the price level of 99.06% and the companies will be operating the significant level of international operations on the basis of the international bonds policies in the Brazil. The past analysis indicates that the percentage invested in the international debt securities was lower for the bonds having maturity period less than 1 year. According to the common practices it is analyzed that international debts are mostly for the long term policies and they are supporting the companies in the economies for getting the loans and reducing the impact of exchange rates. In the period from 2005, it can be analyzed that the international debt having the maturity of less than one year were based on 7.38% of the total international bonds and the 5.25% of the government long term bonds. The proportion of this debt instrument is increasing in the period from 2005 onwards. It can be said that the government instruments in the Brazil comprise of the points that they are increasing the level of debt provided by the government and increasing the debt facilities for the companies. Thus, this is making the loan availability easier in the economy of Brazil (Cbonds.com, 2016). Non-government debt in the Brazil is based on the private level debt. The private bonds in the Brazil are not having the significant position as compared to the Government debt. The private debts are considered to be the corporate debts in the country. In this way, the outstanding issues for the corporate bonds in the Brazil have risen approximately 10% in the period of 2011. However, the duration rates in the economy are short term and ‘the investors are not enjoying the position for getting their wealth increased in the long run. In the corporate bond sector of the Brazil it is estimated that 90% of the corporate bonds are linked with the indexation rates. In this regard, the private bonds on the fixed rate basis comprises of only 1% of the total private bonds. The research has shown that the 70% of the private bonds were purchased by the banks in the period of 2011 in the Brazil. Therefore, the liquidity in the bank is less sensitive because they are holding the private bonds in this market. In addition to this, the securitized instruments in the Brazil Debt market are growing with the significant percentage but they are not rapidly advancing with higher base. In relation to the securitized instruments, the asset backed securities in the non government bond sections are too much active. The asset backed securities are based on the sale of real estate securities and it has become one of the most important and fast growing non government debt instrument. This is due to the reason that this instrument is based on very much low starting point and provides the higher level of the marginal funds to the investors in the debt market. Therefore, this bond is facilitating the large sector facilities in the Brazil and making reduced level of the economic pressure on the real estate market. As a result the real estate market and the securitized asset backed securities are increasing rapidly (Park, 2012). The credit rating agencies in the Brazil are of significant importance. They are playing a major role in reducing the foreign currency credit risk in the Brazil. It can be analyzed that the credit rating agencies in the Brazil are implementing the policies in relation to mitigating the sovereign credit risks. According to the reports it has been analyzed that “A current opinion of the creditworthiness of a sovereign government, where creditworthiness encompasses likelihood of default and credit stability (and in some cases recovery)”.The credit rating agencies are implementing the policies with regards to the to solve the problems of the financial obligations which are imposed on the commercial creditors. The recent analysis on the agencies and their policies have analyzed that they are not implementing the right level of policies in relation to mitigating the risk in the economy of Brazil. The agencies who have rated Enron have given the rating of triple A to the toxic subprime mortgage. Their rating has caused the down grads on the sovereign debt of the Brazil. According to this statement it has been analyzed that the companies should have to be taking the credit rating agencies seriously and analyze their roles in an effective way. This issue has not yet been regarded as seriously by the companies in the economy of Brazil due to the facts that the Brazil is an external auditor which states that the debt in the economy is denominated in the foreign currency transactions. In this regard, the Brazil companies can enjoy the facility of paying all of the debts in the foreign currency values which can reduce the impact and pressure of higher level of exchanges rates. In addition to this, it has been analyzed that the federal government of the Brazil can never become insolvent because they are having no obligation for paying debt in the consideration for their own currency values. Therefore, there is no pressure on the government of the Brazil that they should keep track of the sovereign credit rating agencies. It can be analyzed that there is no external credit risk developed in the external debt market of the Brazil. The Central Bank reports have shown that the Brazil agencies are not taking it into account for denominating the government debt in the local currency and it has become one of the beneficial policies in the country. In this way, the foreign currency of the Brazil is denominated in the United States dollar and the country is getting benefit for having the sufficient capacity for paying the debt. Thus, the debt capacity of the country has increased and the foreign currency denominated government debt in the country is $72 billion and the international debt position in the country is stated as the $363 billion according to the reports of 2015. The graph indicates the level of debt rises in the past ten years in the Brazil. Therefore, it is regarded that the credit rating agencies and their ratings are not imposing the high level of threat to the economy of Brazil and the country has lesser chances to go into the crisis period. However, it can be analyzed that the credit rating agencies in the Brazil are not playing an interesting role and strengthening the economic policies. It can be said that the policies of the government its self are good for protecting the country from the crisis period. If the condition in the future gets poor then it can be said that the government has the protective measures with regards to the saving the economy from the crisis period. The denominated currency in the foreign currency is playing the great role in effect. The derivative market of the Brazil has been very popular among the world wide countries. The foreign investors have been investing in this market in order to make large amounts of money in order to get the benefit from the benchmark interest rates. The number of derivative contracts in the Brazil markets has increased and approximately 540 million contracts were signed in the period of 2015. These derivative contracts in the economy of the Brazil are based on approximately 2 trillion worth. It can be seen that the increase in the derivative contracts was 4.2% as compared to the signed derivative contracts in the period of 2011. Initially outlined in the late 1970s, the derivative market took into account items in light of Brazil’s profile as characteristic assets. Later, the criteria of the market have changed and now remote trade and futures are the main part of all derivative exchanged instruments. In addition to this, the greatest members are institutional investors and banks, which represent just about 70 % of exchanging, as per BM&FBovespa information. As of late, the offer of remote members has risen relentlessly to achieve 25% this year, up from 16 % in 2014. Thus, the fame of Brazil’s derivative business sector can be clarified partially by its emphasis on trade exchanged items: around 90 for each penny of all agreements are exchanged and cleared through the focal counterparty BM&FBovespa itself (Rodrigues, 2014). After taking into account, the different kind of determinates of the bond market of the Brazil it is analyzed that the bond market should have to maintain the capital adequacy. It is recommended that the prudential rules should have to be implemented on the bond market so that the risk of biasness for the government debt should be reduced. In this regard, for maintain the capital adequacy; the government should need mange the funds in a way that they are not being biased for the regulatory treasury papers. Moreover, the higher level of interest rate is causing the higher level of uncertainty in the market of Brazil and it should have to be reduced in relation to controlling the fluctuations in the market as well as reducing the level of pressure on the government. In this way, the interest rates should have to be reduced in the brail market so that the bond holders and issuers can gain benefit from the transactions as well as the government do not feel pressure to closely monitor the market efficiencies. In addition to this it has been analyzed that the credibility of the central bank in relation to the inflation factors is of higher significance. This credibility has the capacity to decrease the interest rates level in the economy by providing the independence to the instrumental products and their holders. It reduces the probability of the level of uncertainty in the market and helps in improving the fiscal conditions. Therefore, the government will not be requiring the higher level of financing facilities and the effect of crowding out in relation to the credit spread will be decreased. It can be said that the uncertainty reduction will result in decreasing the credit risk and the government will have to give lesser monitoring probabilities. Currently, the role of credit rating agencies is not much efficient in the debt market of Brazil because they are not taking the responsibilities for closely monitoring the ratings of the companies. It is recommended that the government should need to take initiatives in order to closely monitor the inefficiency of the credit rating agencies. This will result in increasing the fair ratings of the companies and the domestic as well as the international investors will not be facing the loss. Although, the Government is not facing threat and the debt market of the Brazil cannot become insolvent but it is analyzed that the investors will face higher level of risk if the credit rating agencies have not proven the right kind of responsibilities towards the debt market (Leal & Carvalhal-da-Silva, 2008). Derivatives are basically the securities which are used to secure the prices of the products. The prices of the derivative products are based on the value of the underlying asset. The underlying assets can be off any type such as bonds, stocks, currencies and the interest rates and commodities. 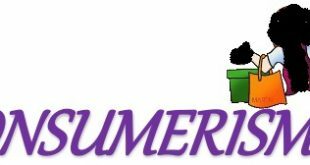 In this respect, the over the counter products in the derivative products are being extensively used in the worldwide market in order to reduce the risk of loss. The overt the counter products are the bilateral arrangements and these are not based on a formal exchange. In addition to this, the exchange traded derivatives are based on the standardized derivative contracts which are named as the option and the future contracts. These contracts are traded on the formal exchange transactions. These exchange traded derivatives in the countries have their own characteristics and consist of the standardized products. These derivatives consist of having an initial deposit amount and the margins of these settled according to the instructions of a clearing house. Over the counter products in the market of the Australia are smaller as compared to the global use of the derivative markets. In this regard, over the counter market in the Australia is dependent upon the larger amounts of the cross boarder arrangements. The reports of the CFR on the derivative market states that the financial institutions in the Australia are using the higher level of over the counter derivatives in the Australia. In this regard, it can be analyzed that approximately 60% of the derivative market of Australia is based on the domestic over the counter swaps and 40% is based on the cross-border activities. Over the counter market in the Australia is based on lesser number of currencies and most of the global contracts in the Australia for the over the counter products are denominated in the US dollars, Japanese yen and the Euros. This activity reflects the larger size of the markets to be grasped by the over the counter product of Australia (Rba.gov.au, 2014). The exchange trade derivative in the Australia was launched in the 2001 and it was closed after making the breach of the financial covenants. In this regard, the country started to gain access to a United Kingdom based exchange derivative program which helps in securing the investments of the investors. In this way, the trade exchanged derivatives in the Australian debt economy are depending on the institutionalized subsidiary contracts which are named as the choice and the future contracts. These agreements are exchanged on the formal trade exchanges. These trade exchanged derivatives in the nations have their own particular qualities and comprise of the institutionalized items. These derivatives comprise of having an underlying store sum and the edges of these settled by guidelines of a clearing house. Currently, the Australian economy is set as the preference economy which in which the currencies are traded for the exchange. But the trends have shown that the dissertation of the exchange trade derivative has increased over the period from 2004 and the market is not able to adapt the successful policies in providing derivatives to the investors. In this regards, the largest level of turnover with approximately 62% of the turnover in the period of 2007 has been seen in the Australia for the exchange-trade derivatives. It is expected that this will result in increasing the higher level of the hedging activities implemented by the non-financial companies. Thus, the companies in the Australia are finding it as an opportunity to reduce the risk by locking up the interest rates prices by the future and options contracts. In the recent period, the Australian economy has attracted a wide range of foreign companies who are making changes to the exchange trade derivatives. In this respect, the electronic trading is providing the companies with an ease of making the exchange and get the funds managed by the banks of the Australia. thus, the exchange trade derivatives in the debt market of the Australia is expanding significantly and the foreign investors are getting benefit from the lower prices for hedging their interest rates with the banks of Australia(Rba.gov.au, 2010). The daily turnover in the over the counter derivative market in the United Kingdom is recorded as $171 billion in the period of 2013. This was approximately 131% increase in the turnover recorded in the previous year. In this regard, the higher level of over the counter product in the United Kingdom has shown that the OTC derivative market in the United Kingdom is growing rapidly. However, it can be analyzed that the interest rate market in the United Kingdom is still larger than the OTC market for the interest rates. The currencies in the interest rates market are growing rapidly and they are making higher level of changes in the OTC product market. In the recent years it has been analyzed that the OTC market has adapted 56% of the business in the country. The OTC market in the United Kingdom has been enjoying the higher level of the success position in the market and it has been increasing significantly. It is expected that it will continue to grow in the future as in the previous years. Thus, the investors will be able to gain the significant benefits by investing in the OTC derivatives of this market. Therefore, it is analyzed that this market will bring higher level of advantages for the investors and increase the positive returns by securing their level of investments. In addition to this, the exchange trading derivative market in the United Kingdom is not increasingly rapidly as it was in the past. In this respect, the average daily turnover in this market is expected to be $637 billion. The higher level of the turnover in this market indicates that the country is taking right actions in order to increase the support for the foreign exchange investors. It is analyzed that the foreign exchange derivative markets in the United Kingdom is based on the operations of the foreign companies which are operating in the United Kingdom. They are covering approximately 85% of the turnover of the overall exchange trade derivative market. However, the higher level of merger and acquisitions in this economy has contributed to change the external marketing conditions with regards to the exchange rate derivatives. In this respect, the value of the exchange trade derivatives has decreased in the current years. This is due to the reason that the companies making merger and acquisitions with the international countries are not incorporating the right level of the strategies which can help in increasing the value of exchanges trade derivatives. Most of the companies having international subsidiaries are making transactions with their subsidiaries which they are not reporting on the exchange trade data. In this respect, the exchange trade data is not reporting the fair rates and they local exchange in the economy are unable to obtain the right data values and operating in a good business environment. These hidden transactions of the companies are mot providing the investors with the real information. Thus, the value of the exchange trade derivatives have decreased and thus the attraction of the exchange market of the United Kingdom. The current reports of the exchange trade derivative have shown that the value of the exchange trade derivatives will kept declining in the future because of the facts that the higher level of merger and acquisitions has been taken place in the economy. In relation to the future concern it can be said that the effectiveness of the exchange trade derivative market in the United Kingdom is not beneficial. So, the companies should not be considering taking the exchange trade derivatives as the good derivative financial product. They should not be making the exchange trade derivative as the future financial concerns. Therefore, the market of the United Kingdom for the exchange trade derivative is not beneficial and the exchange trade data is not reporting the fair rates and they local exchange in the economy are unable to obtain the right data values and operating in a good business environment. The above discussion on the interest rates derivatives in relation to the over the counter products and the exchange rate derivative can be said as an important factor of the research. It is analyzed that the derivative for the over the counter products in the United Kingdom is much beneficial for the investors. This is due to the reason that the OTC derivative products in the United Kingdom are showing the higher level of the turnover as compared to the ORC market of the Australia. In this respect, the OTC products in the United Kingdom are more attractive and beneficial for the investors. The daily turnover in the over the counter derivative market in the United Kingdom is recorded as $171 billion in the period of 2013. This was approximately 131% increase in the turnover recoded in the previous year. This market in the United Kingdom is growing in a faster way. Thus it will help in securing the investments of the investors from the higher level of risk. 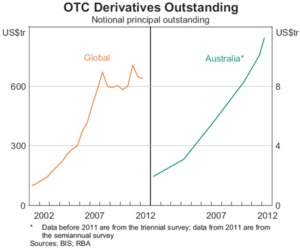 On the other hand, it can be seen that OTC derivative market of the Australia is also growing rapidly but the increase in this market is not relevant as compared to OTC derivative market of the United Kingdom. In contrast with the OTC derivative market of the United Kingdom which can be converted into many different kinds of the currencies, the OTC derivatives of the Australia can be converted into lesser currencies. Australia is dependent upon the larger amounts of the cross boarder arrangements. The reports of the CFR on the derivative market states that the financial institutions in the Australia are using the higher level of over the counter derivatives in the Australia. In the Australia for the over the counter products are denominated in the US dollars, Japanese yen and the Euros only. Thus, it cannot be considered as a good decision for the investors to take the help from the OTC derivatives of the Australia. The investors who are taking the decision in investing in the debt market of Australia have either denominated currency in the Australian dollar or either their exchange rates are not relevant to the UK pound sterling. 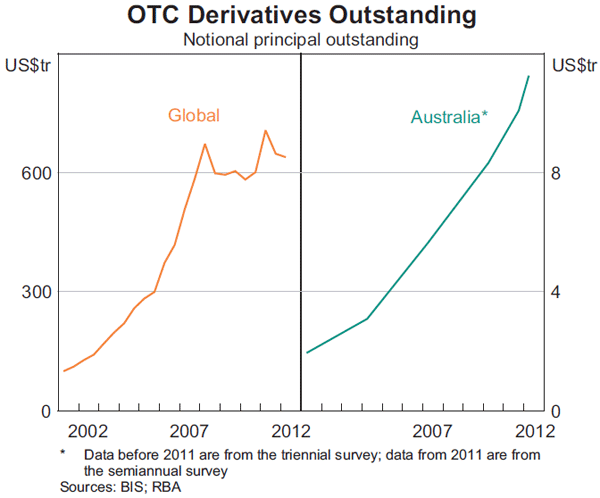 Only in this case, the OTC derivative products in the Australia would be an attraction for the investors. Therefore, it cannot be said that the investors would be getting the significant benefit from the OTC interest rates derivatives. It is recommended that if the investors have to make compression among the Australia and UK OTC product derivatives then they should have to select the OTC market of the United Kingdom and use the UK pound sterling as the denominator. This strategy will be giving them benefit and the chances of loss will be reduced. Moreover, the long discussion on the exchange trade derivatives has also been made on both markets and their opportunities. In this regard, if the comparison is made among the both markets than it would suggest that the exchange trade derivatives of Australia are better opportunity to be taken as compared to the exchange trade derivatives of the United kingdom. There are two reasons for this. Firstly it can be said that the derivative market for the Australia cannot become insolvent because of the denominated currency for the Australia is not Australia itself. The prices of the Australian products are locked with the prices of the United States dollar. In this way, if any currency which is not allowed to trade with the United States dollar then the exchange rates derivatives for option pricing can be used. This will help increasing the wealth of the investors because in the option pricing of interest rates there is no chance of loss. This would result in increasing the benefit to the investors only. In addition, if the market prices of the Australian denominated products have decreased then the investors will have the opportunity to not exercise the option. This exchange rate derivative of Australia is suggested because of the facts that this market is increasing rapidly in the Australia as compare to the declining position of the United Kingdom exchange trade derivatives. It is analyzed that the foreign exchange derivative markets in the United Kingdom is based on the operations of the foreign companies which are operating in the United Kingdom. They are covering approximately 85% of the turnover of the overall exchange trade derivative market. This cannot be suggested as an effective policy to invest in the exchange traded market of the United Kingdom because there are lesser chances of getting benefit through this transaction as compared to the exchange traded derivatives of the Australia. Thus, the comparison and analysis indicates that the agencies and the investors should not be using the exchange trade derivatives of the United Kingdom because there will be lesser benefit to those companies in relation to the points that if they have spent their money in the Australian market of the exchange trade derivatives. In this regard, the investors can use the strategies of the making portfolio and getting benefit in the exchange trade derivatives. Therefore, if there is an expected loss in the exchange trade derivative for an investor due to the market conditions, then the investors can make portfolio and take the benefit of countering the loss of one investment with other investment. Moreover, the exchange trade derivatives in the economy of the Australia are also locked up with the United States Dollar contracts. This will help in making the future contracts more flexible because of the facts that the changes in the United States Dollars will also make changes in the base interest rate of the Australian dollar. Thus, the positive impacts of the exchange trade derivatives would be analyzed by the facts that the U.S dollars is flexible and does not incorporate higher level of changes in the economy. On the other hand, the exchange trade derivatives of the United Kingdom are at the significant risk and having lesser potential for benefit. The past trend has shown that the merger and acquisitions in the economy of the United Kingdom have been significant and they have not provided the right ad fair kind of exchange trade derivatives in the United Kingdom. The market of the United Kingdom for the exchange trade derivative is not beneficial and the exchange trade data is not reporting the fair rates and they local exchange in the economy are unable to obtain the right data values and operating in a good business environment. Thus, it is suggested that the companies and the investors should have to be considering the exchange trade derivatives as the most beneficial products with regards to making portfolio of the Australia. This will be an effective policy and the investors will be taking of the benefits of the exchange trade derivatives. The report has made an extended research in relation to analyzing the effect of the bond markets in the different countries. In this respect, the bond market of the Brazil has been discussed in detail. The participation of the foreign investors in the economy has increased and the debt market of the Brazil has started to increase. It is analyzed that the private investors in this economy prefer the short term variable rate debts because of the facts that the longer debt period due to the exchange rates policies are not beneficial for them. In relation to the debentures, the floating interest rates were increased to the higher level by 42.12% in the period of 1998. Moreover, the inflation adjusted debentures comprises of 12.45% of the total debt market of the Brazil. The very first law in the Brazil was implemented in the period of 1970 which was only supporting the leasing transactions in the real estate markets. The proportion of the international debt in the Brazil is 75.12% and it is decreasing to the level of the 57.73% in the period from 2010 to 2015. It is analyzed that the Brazil has introduced the international bond policies which will be matured in the period of 2026. Currently, the role of credit rating agencies is not much efficient in the debt market of Brazil because they are not taking the responsibilities for closely monitoring the ratings of the companies. It is analyzed that the government has taken the actions for the regulating the fiscal needs and making the regulations to be effective in the country. These fiscal needs are implementing the pressure on the external economy and private debt levels. Moreover, the role of debt market and the derivatives in the country of the Australia and the United Kingdom has also been analyzed and the comparison has been made among the OTC and exchange trade derivatives of both economies. Over the counter products in the market of the Australia are smaller as compared to the global use of the derivative markets. It can be analyzed that the interest rate market in the United Kingdom is still larger than the OTC market for the interest rates. The currencies in the interest rates market are growing rapidly and they are making higher level of changes in the OTC product market. Currently, the Australian economy is set as the preference economy which in which the currencies are traded for the exchange. But the trends have shown that the dissertation of the exchange trade derivative has increased over the period from 2004 and the market is not able to adapt the successful policies in providing derivatives to the investors. On the other hand in the Australian market, the current reports of the exchange trade derivative have shown that the value of the exchange trade derivatives will kept declining in the future because of the facts that the higher level of merger and acquisitions has been taken place in the economy. The comparison has shown that the investors should use the OTC products of the United Kingdom and Exchange change trade derivative interest of the Australia. Leal, R. P., & Carvalhal-da-Silva, A. L. (2008). The Development of the Brazilian Bond Market. the journal of international finance , 1-73. Park, J. (2012). Brazil’s Capital Market: Current Status and Issues for Further Development . org , 1-19. Paula, L. F. (2011). Banking efficiency, governance and financial regulation in Brazil. Creative Commons Attribution , 1-22. Teixeira, N. (2013). Brazil Local Markets. CREDIT SUISSE SECURITIES RESEARCH & ANALYTICS , 1-83.